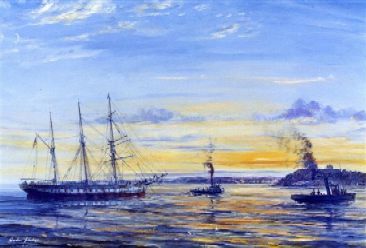 After her purchase by Captain Dowman from the Portuguese, Ferreira & co, she was towed to Falmouth to be restored in Falmouth Docks. By Gordon Frickers measures 61 x 91 cm (24″ x 36″), Oils, Original Sold, still available as a print on canvas, signed numbered print from this web site. Restored and returned to her original name and appearance, Cutty Sark became a boys training ship based at Falmouth and was occasionally used as the committee boat for Fowey Regatta. She is now permanently dry docked at Greenwich London and open to the public. “Last Arrival“, having been exhibited on-board “Cutty Sark” at Greenwich at the invitation of Simon Waite, her then Captain, it was proposed the Portuguese embassy would buy the painting and present it to the ship. Unfortunately this did not happen however, happily, the painting was sold to a direct descendant of Vasco de Gama. Best source of further information, “The Log of the Cutty Sark” by Basil Greenhill or ask Gordon Frickers. See also the painting of “Ferreira’s” “Last Departure“!